In this modern age, the Internet has given everyone a voice and a way of socializing. Political websites have had a surge in the last few years and people love it because it allows them to easily find information about a certain candidate, political party, campaigns, events, and more. WordPress is the best platform to get started if you are planning on building a political website because it is easy to use, free, and open-source. Additionally, premium WordPress themes are cheap and you will not have to spend more than $70 of your budget on one. The best choice is to go with a political WordPress theme because they are specifically designed and developed with this niche in mind. They come with specific design elements and features that will help you craft a unique and professional website. To keep it short, here are the best political WordPress themes on the market. 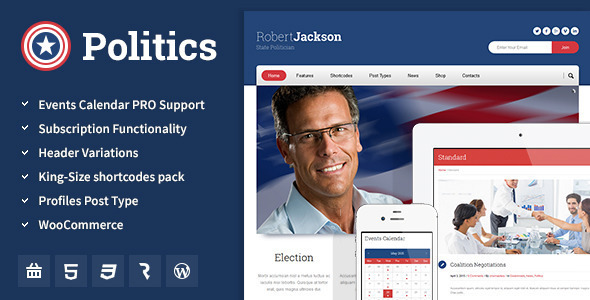 Candidate is an amazing political WordPress theme dedicated to politic related websites. It is 100% responsive and adaptable to all screen resolutions and devices. Candidate also uses Revolution and Swipe sliders, two slider plugins perfectly adaptable to touch screen devices. Candidate was crafted to assure the user gets a full creative experience using the themeRex framework. Visitors will be able to book online appointment easily thanks to the theme’s WP booking calendar plugin, which comes bundled with Candidate. Get the full web development experience with this amazing theme! 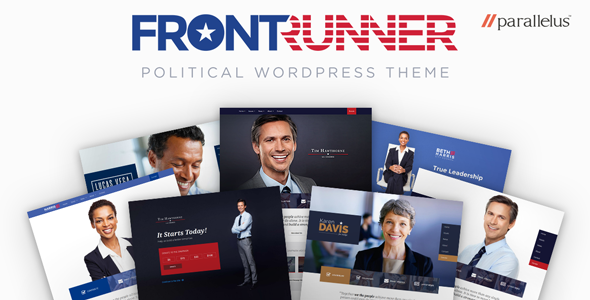 Frontrunner is one of the best political WordPress themes because it is eye-catching, efficient, fresh, and modern. Apart from its beautiful design, the theme also comes with a bunch of useful features that will increase its flexibility and overall worth. Frontrunner comes with an extensive documentation to help anyone get out of a tough spot easily. If this is not enough, then their support team is always ready to answer any question in a timely and professional manner. Frontrunner is certainly raising the bar high. 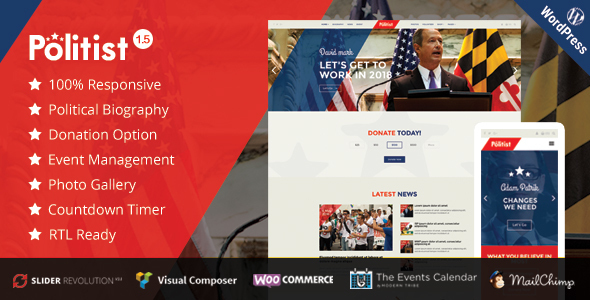 Campaign is an excellent, beautiful, well-designed, responsive premium WordPress theme that is crafted for political websites. Campaign has unlimited layout design variations, thanks to their integrated page builder and admin panel. Campaign comes with WooCommers and is set up to include its own online shop. Taking advantage of this amazing feature you will be able to sell your campaign items and spread the word. Every single element of this theme will guarantee the development of a successful website. 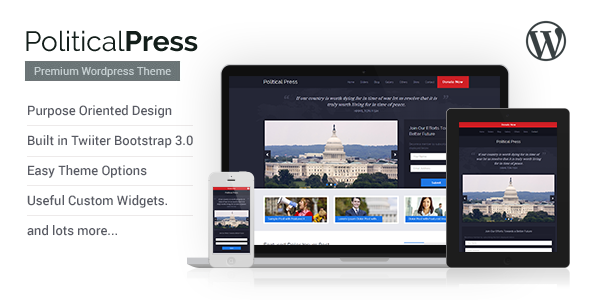 Political Press is a beautiful, responsive, eye-catching WordPress theme that will certainly enhance your website and give it an extra edge. It is easy to install and it comes with the demo content included for testing purposes. Political Press is SEO friendly and was built using the latest web development technologies. You can translate and launch your website in multiple languages because this theme is compatible with WPML. Through the theme’s admin panel you can easily make creative decisions to improve the overall look and feel of your website. Political Press is an awesome choice for beginners and veterans WordPress users alike. 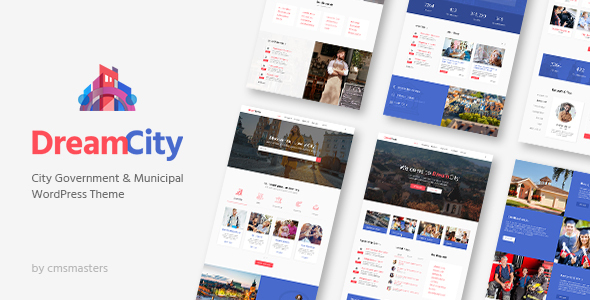 City Government is an incredible, smooth, responsive premium political WordPress theme. City Government has been devised to be retina ready, responsive, SEO friendly, and translation ready. With City Government your politics related website can take various shapes and layouts in order to test out what works best for you. 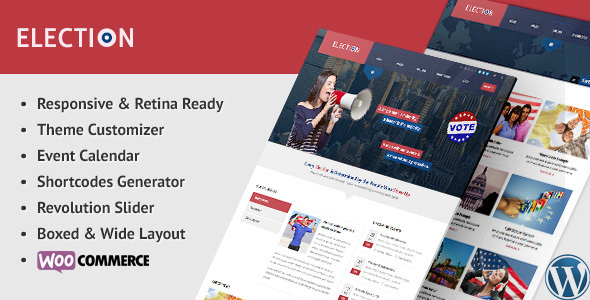 This theme is a very capable one packed with dozens of time-saving features such as mega menus, events manager, virtual city tour, unlimited colors, layer slider, dozens of typography options, and the option to import the demo content. Using this premium theme your content will stand out like no other. Give it a shot! 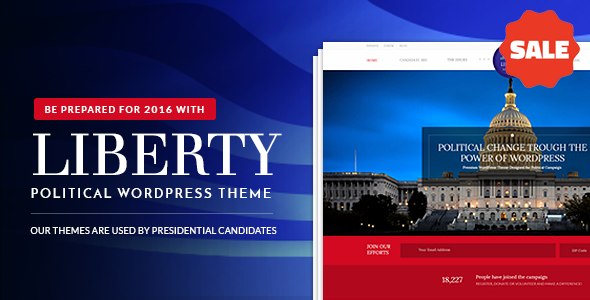 Candidates is a great looking, simple, modern, and fresh WordPress theme perfect for politics related websites. It comes with various theme features that will allow impressive changes to theme’s design and functionality. With Candidates you save more than $70 because it comes bundled with several premium plugins: Slider Revolution, Multiscroll plugin, Isotope JS Gallery, Flickity JS Carousel. More than that, Candidates features an events manager, King Composer page builder, and five uniquely designed homepage layouts. You can get a good look at Candidates through its live preview. Unite is a modern looking, clean, minimal, responsive WordPress template. The team behind this theme did a great job with the theme’s design and functionality creating a theme that holds its own against the competition. Page layouts are easy to manipulate with Unite thanks to the integrated Visual Composer as well as the theme’s panel. Unite also comes with a shortcode builder, custom theme panel, translation ready, PO Composer, media content manager, and an extensive documentation. You really cannot go wrong with this theme. 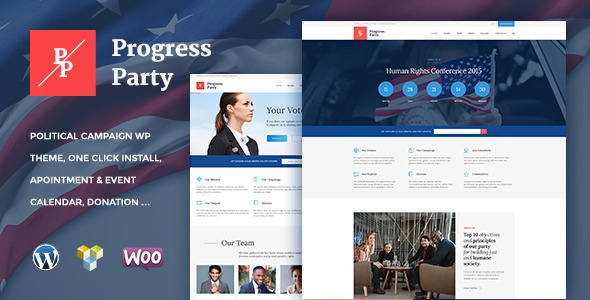 PoliticalWP is a professional, robust, responsive, modern, and rather new premium WordPress theme. Through careful design and top-notch development, ThemeSLR has managed to put forward an impressive theme perfectly suitable for political websites. 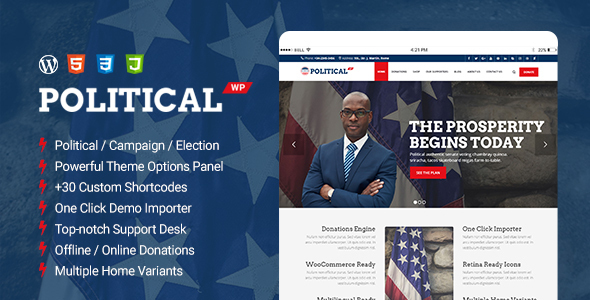 PoliticalWP is chock-full of impressive features that will help anyone put together a professional, intuitive, and engaging website in a couple of hours. This theme comes with 7 beautifully crafted demos, more than 50 page layouts, and over 40 design elements. Two powerful plugins come bundled with this theme: Visual Composer and Slider Revolution, both of which are necessary to build a complete visual interface. WPPoliticalZ is a simple, straightforward, clean, and attractive WordPress template. It is a full and complete theme crafted to meet all expectations. It is highly functional, easy to use and set up. WPPoliticalZ includes various page layouts ideal for this niche that will help you develop a website in a heartbeat. It also supports most popular plugins such as events calendar, mailchimp, bbpress, buddypress, slider revolution, and many others. You can unleash your creativity and perfect the website’s design using the theme’s admin panel. DreamCity is a relatively newer theme with a great looking design and awesome functional elements. With DreamCity you have at your fingertips all the necessary tools to craft a beautiful and professional website certain to stand out from the rest. You have ready to use homepage demos, blog layouts, portfolio styles, an events calendar, more than 90 shortcodes, animations, and a form builder. If you are unsure where to start, the theme comes with a well written documentation that will help you get started. Again ThemeSLR takes the cake with this stunning, complete, reliable, premium, responsive WordPress theme. 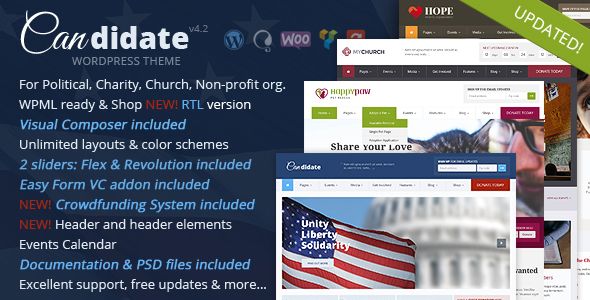 You can tell by its rating, design, and features that Politica is a high quality theme. Politica also comes with specialized pre-built demos and a child-theme. Some of the theme’s key features are SEO optimized, video sliders, various shortcodes, testimonials blocks, Google maps, donation plugin, WooCommerce shortcodes, and a full responsive and retina ready layout. You should definitely try now this handy theme. 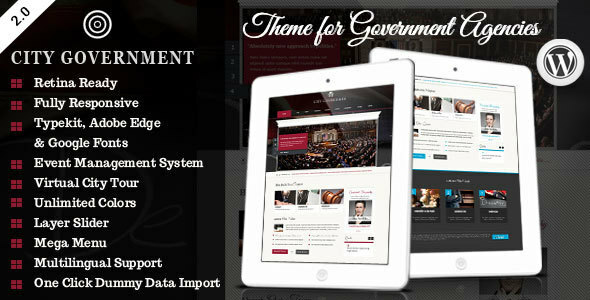 Nominee is an impressively clever, modern, professional, fresh premium political WordPress theme. You can immediately tell that this theme is a very well thought out platform ideal for politics. It comes with outstanding niche related features that include a candidate profile, campaigns sections, manifesto, issues, events, and a PayPal donation system. Using Nominee you can quickly craft an extremely sophisticated and serious website that will get your point across. 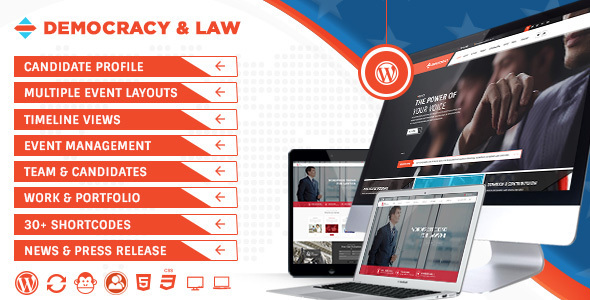 Democracy is a reliable, professional, creative, and responsive WordPress theme. It’s an amazing platform for crafting beautiful website for various political related purposes. Democracy is full of features and with them anyone can create an impressive website that will showcase your content. From candidate profiles, event layouts, event manager and timeline views to team, candidates and portfolio showcases, this theme has it all. Democracy is fully responsive and cross-browser compatible in order to maximize your reach. Politic comes with an excellent design and a bunch of niche related features capable of attracting many visitors and turn them into regulars. The homepage is created using widgets and you have full creative control over it. Politic is a great choice if you want to showcase your content in a modern and engaging way. Some of the key features of Politic are the custom widgets, custom menus, unlimited sidebars, visual shortcode creator, unique page templates, and some more. This theme also comes with an extensive documentation and a support team always eager to help. You have to realize that the online does not do well with mediocrity, and the sooner you do it, the better. Your website is your online business card and it has to represent you and your vision. Liberty is the perfect theme to do this with, because of its stunning and professional design. You don’t have to have tech knowledge in order to install, personalize or use this theme. The installation takes mere minutes, and you can easily customize the theme from its potent admin panel. Liberty is compatible with WooCommerce and will allow you to sell campaign products easily. It even has the Events Calendar plugin to let you create and manage all events. 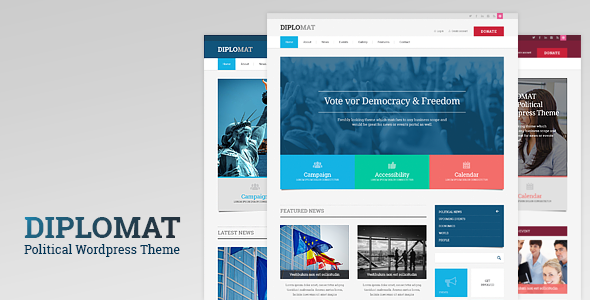 Diplomat is an efficient, clean, user-friendly political WordPress theme. 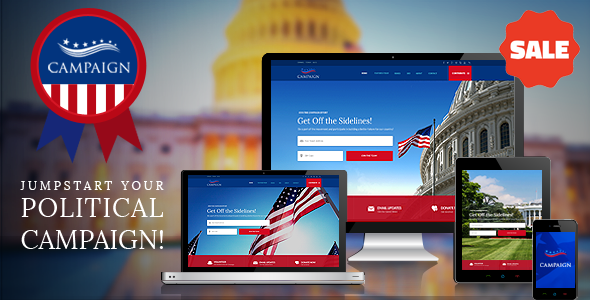 It has been designed and developed to be a great solution for any type of political website. Diplomat is very easy to use and set up; it basically requires only your content to go live. It support 5 different news post layouts, drop-down mega menu, events plugin, advanced site search, content composer, and a news subscription. Take your website to the next level with Diplomat! 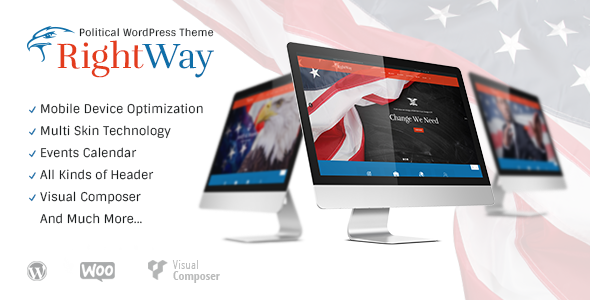 Right way is an incredibly powerful political WordPress theme. You can see how loved it is from their reviews and rating. Right way is a one of the best choices for any political related website. Right way is extremely intuitive, fully responsive, and cross browser compatible. It includes multi-skin technology, events calendar, several variations of header styles, and much more. The potent Visual Composer page builder plugin comes integrated with it and using it you can produce professional page layouts. 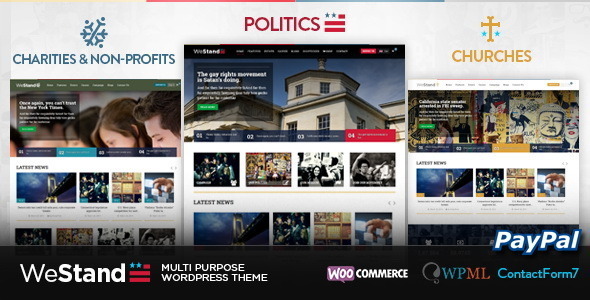 Politico is a potent, beautiful, user-friendly WordPress theme. It comes with an extensive and impressive documentation that will guide you through all the theme’s features in order to enable the development of a clean and professional political website. Politico is compatible with all popular browsers and all devices. The theme’s options are found in the live customizer from where you can easily personalize the theme and play with the design. Asides from these, with Politico you get a lifetime of free updates. Westand deserves its place on this list. It is a sleek, stylish, elegant, and professional multipurpose WordPress theme. Its awesome features and seamless design make it a fitting platform for crafting powerful and professional websites. Westand allows you the option of installing the demo content and give your website the same look as their demo. With it you can easily manage your events and causes, as well as raise money for them. Westand is a well-documented theme and their support team is always ready to answer any question. Agenda is a mesmerizing, tasteful, fresh, and serious WordPress theme suited for a politician. This theme is properly designed to look professional on any browser, device, or screen resolution. Agenda offers impressive theme features that will allow you to manage all your needs through it without using other plugins. It provides campaigns management, team management, media management, and events management. Agenda is also bundled with a powerful page builder to help build unique and stunning page layouts. 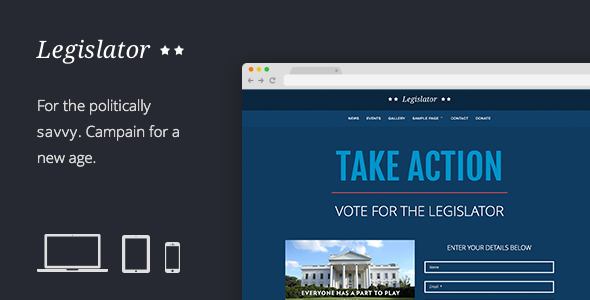 Legislator is a political specialized WordPress theme that is retina ready and fully responsive. It is equipped with useful features and a bunch of customizing options. Legislator has 6 skin versions included, a donation system, events manager, MailChimp integration, exclusive plugins, custom templates, and the demo content. With this theme you will get a clean and clear design ideal for a professional look. 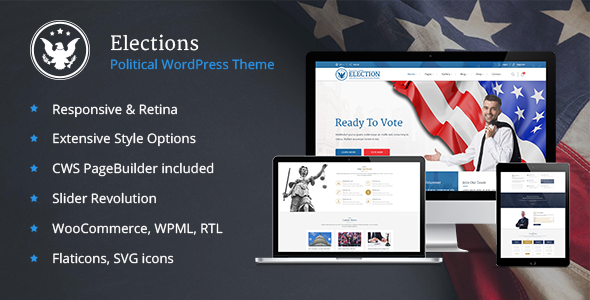 Election is a stylish, fresh, modern, easy to use, and fully responsive WordPress website theme. Election has been developed by Softwebmedia to aid in the creation of professional political websites without having any previous coding experience or being tech-savvy. Election is fully compatible to all major browsers and mobile devices. Using theme’s customizer you can effortlessly personalize your page layouts to suit your style. Integrated with the theme is a shortcode generator plugin that will allow you to add several design elements to your pages like columns, images, list styles, pricing tables, and more. 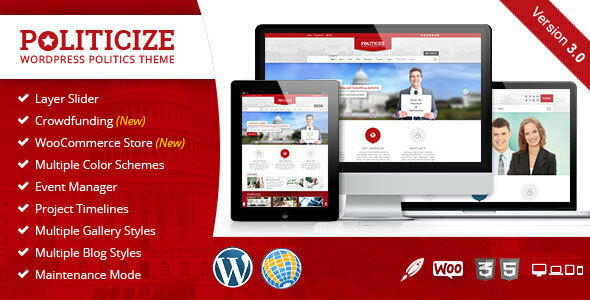 Politicize is no doubts one of the best political WordPress themes out there! This theme has incredibly useful features and a stunning, modern design. It comes with a couple of pre-made demos that you can use immediately, a full responsive layout, crowdfunding, RTL support, layer slider, unlimited color panel, event manager, donation system, and various blog layouts. Politicize allows customizations to be easily made with its admin panel. To learn even more about this impressive theme, I recommend checking out its live preview. 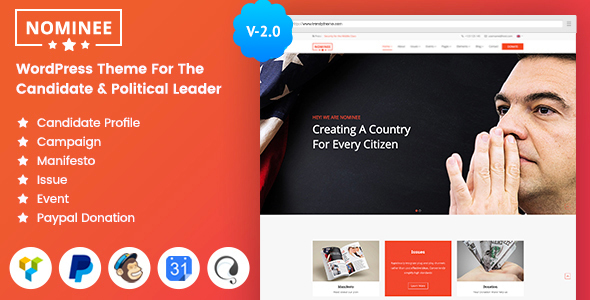 Candidate is a premium political WordPress theme that is fully responsive and offers incredible features perfect to showcase any type of political content. It comes integrated with the powerful page builder plugin, Visual Composer, which is the perfect tool to build a unique and engaging website. This impressive theme also comes with an incredibly useful crowd funding system, font-end campaign submissions, perks & rewards features, and WooCommerce. Additionally, Candidate is compatible and tested with major payment gateways and translation plugins. Try Candidate out! 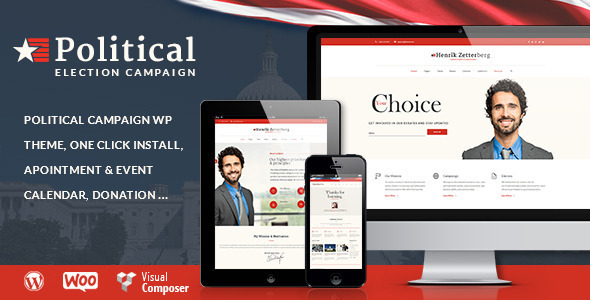 Elections is a praiseworthy, reliable, clear, and new political WordPress template. This theme works with most browsers and devices, being 100% responsive and retina ready. With this theme you get a large variety of pre-built homepage demos that you can choose from and use in minutes, without wasting time designing them yourself. If have the necessary time and want to get your hands dirty, you can also design a layout yourself using the theme’s integrated builder and the admin panel. Check out the theme’s live preview to see more about it! Politist is a feature rich, stunning, resourceful and responsive political WordPress website theme. Politist is a great template capable of craft a simple and professional website that will perform under any situation. This theme comes with 3 already designed and built homepage demos, or if you want to create something yourself you can easily do that by using Visual Composer and the theme’s features. Some of this theme’s features are: events manager, countdown timer, political biography, donate option, slider action, mission and vision, and latest news. For more info, check out its live preview. When searching for a premium WordPress theme you have to take everything into consideration. By the end of it you should establish if the theme in question in worth your money or not. ProParty is worth it. ProParty is packed with features and all of them are intuitive and flexible. With a large number of header styles, responsive design, two premium slider plugins, online appointment, and various galleries styles, it is sure that your needs will be covered. Parlament is a creative, reliable, fresh, and highly responsive WordPress theme. This theme is very easy to set up, customize, and personalize. With just a few clicks you can have it ready without having to write code or make changes to the theme’s files. Parlament is one of the best political WordPress themes because of its impressive features and the capability of handling any type of content. The design of this theme is beautiful and it will maintain it on all devices and screen sizes. For those who want to dive a bit more into development, Parlament comes with an integrated page builder plugin. If you want to impress your future voters, choose Parlament. 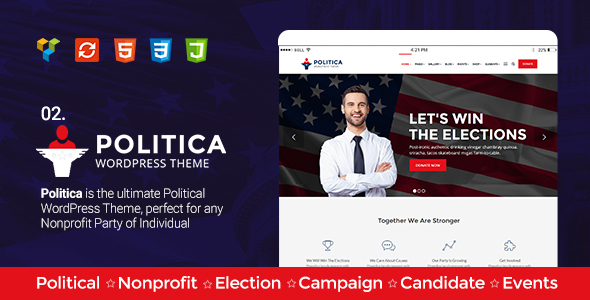 Politics is a fully responsive premium theme able to adapt to all devices, browsers, and screen resolutions. The complexity of its features and beautiful design make this theme a great contender for the others on this list. Politics has powerful customization tools that will make design and development very easy for beginners and veteran users alike. With this theme you will have a far better chance to express your politic stands and reach a wider audience. It will give you a push towards your goals instead of fading into mediocrity. 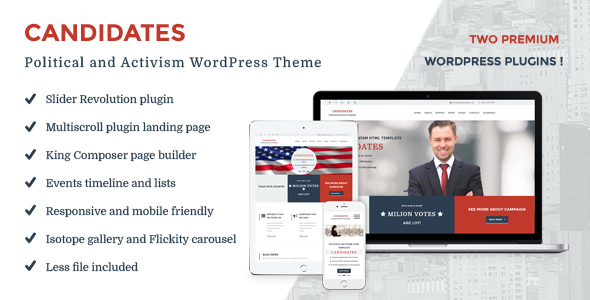 Online, first impressions matter and these theme are without a doubt some of the most successful, innovative, and up-to-date political WordPress themes out there. Let us know if we missed one!